Live music / Bands for hire - for weddings, conventions, corporate or government events, private parties, fundraisers, charities, clubs, restaurants, festivals, etc. Authentic, soulful, elegant, sophisticated, & spectacular! Ceremonies, cocktail parties, special celebrations,& dance parties. Jazz • Soul • Motown • Funk • Rock • Pop • Classical... Small to large: Solo • duo • trio • quartet • 5 to 10 piece bands. The Fever configures in a variety of sizes (solo, duo, trio, 4pc on up to 10pc dance bands) and can provide music for the dancing portion only, or also break away into smaller ensembles for ceremony, cocktails, dinner, even rehearsal parties. We also offer lighting options and additional A/V support. We include emcee services and planning assistance in all of our starting prices. The Fever is different than most event bands. Our musicians can configure into two separate bands, all are full time professional musicians who are dedicated to 'The Fever' and we all play together in various line ups often. The musicians also play with other top professional players in other creative projects (jazz, bluegrass, blues, rock, etc) for clubs and festivals and keep their creativity, skills and interest piqued. Most of The Fever's musicians have advanced training in jazz and music performance, which leads to an ability to deliver crushing solos and can't-help-but-dance grooves for high energy celebrations. We customize everything we provide. We offer planning tools and worksheets, make suggestions, offer vendor referrals and take time to learn what's important to you. We'll help create and organize your dream event - we can be hands-off or hands-on, however you work best. We offer complimentary planning consultation, timeline management & day-of event assistance to ensure that we create an atmosphere & flow that reflects your own personal style & preferences. Personalized planning assistance & Day-of Coordination • MC services for the entire event • Lighting options The Fever's musicians are extraordinary, and The Fever is NOT your ordinary party band! We love the music we play, we keep it fresh and fun, and we not only MC the entire event with sophistication, we also offer planning assistance in the days and months leading up to your big day. We are all full time musicians- playing music is our career, our lives and our passion! Our sound is full, hip, and supremely polished. Whether you want elegant jazz for a refined Cocktail party, enticing funky beats & dance hits for a special celebration—or anything in between—we’ll create a customized show for your entire event. 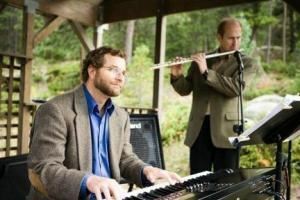 Our favorite clients are those who appreciate a variety of authentic & soulful music- we are real musicians who will play really fantastic music for you & your guests. No cheese here! The Fever offers live music in almost any configuration- Solo/Duo/Trio/Quartet... on up to a 10-piece band! Our 7-piece band includes multiple male and female powerhouse vocals, drums, bass, guitar, keys, hand percussion, saxophone and trumpet- with impressive leads & harmonies performed by two powerhouse female and 3 male vocalists. Want to add a little more sizzle? Bring in an additional horn player or two, to bring up the energy and get a fat horn section sound playing those signature lines from the songs your guests know & love. We even offer a percussionist, whose congas and percussion beats add that "can't help but dance" energy!